The Good Schools Guide is celebrating 25 years with its most comprehensive edition yet. Currently, they’re offering an introductory £9.99 subscription which will let you access all of their online content. 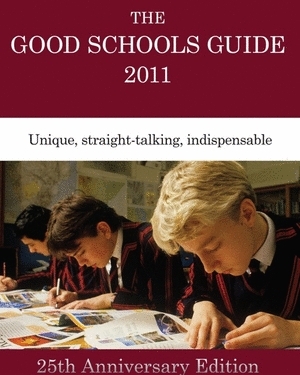 As well as reviewing schools up and down the country, The Good Schools Guide is one of the few publications interested in shining a light on the private tuition industry in the UK. As an aside, The Tutor Pages is one of its recommended websites for private tuition. What are your qualifications? There’s no formal accreditation for tutors – anyone can call themselves one. So ask for chapter and verse: are they a student, an unemployed graduate, or a former teacher with bags of experience? How do you keep up to date on the latest curriculum or exam requirements? Your tutor may have a PhD in astrophysics, but that won’t help your child prepare for grammar school reasoning tests. Make sure the tutor you choose is an expert in preparing for the exam your child will be taking. Are you CRB checked? Over the top if your tutor comes with glowing praise from your friends, but worth asking if they’re unknown and you can’t check them out in other ways. What’s it going to cost? Pin down how much, how often and whom you pay. Does it go to the tutor? To the agency? Do you have to pay extra for the tutor’s travel? What happens if you have to cancel a lesson? Do I have to sign a contract? If so, check what you are committing to. Some agencies try to tie you into a ‘package’ of lessons before you’ve even met the tutor – beware! Can I talk to some of your existing clients? Ask for phone numbers and make sure to ring them. ← Tutors: Become one of Jamie Oliver’s ‘Dream Teachers’! I think question 4 is probably the most important question. If the family pays the tutoring agency directly it is very important to ask how much the tutor earns. If the tutor is paid only a fraction of what is paid to the agency you will most likely be assigned a tutor that lacks education, experience, and isn’t committed. Here in Canada many tutoring agencies only pay about 50% of what is paid to the agency. This is unfair to both the family and the tutor. In my opinion if a tutoring agency retains more then 20% then it is best to find another agency or hire an independent tutor.